Sat along the side of the road for hours while AAA tried to find somebody to tow our 40' 5th wheel. We found JK Towing online and they came to our rescue. They have the capability of towing anything. Their service is fantastic. They arrived in a timely manner and Jason was so helpful and friendly. I would highly recommend this company. They were able to retrieve my disabled vehicle parked way in the back on the 4th floor of a 6 level underground garage. I am sure it was not easy. I was expecting a huge bill but I was pleasantly surprised at how reasonable the bill was. They are honest and took good care of my vehicle and delivered it to my mechanic in good condition. I saved them in my phone and when I need a tow again I will be calling them instead of waiting for hours for someone else. These guys are amazing!! My daughter and I were stranded when my wheelchair van broke down. 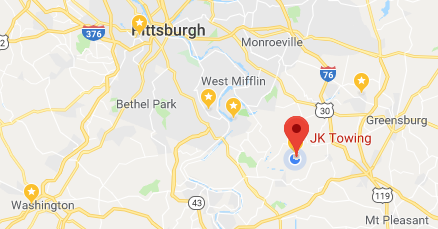 Two hours from home, and worried what we were going to do...I called JK Towing. They were there within estimated time. He was knowledgeable in towing my lowered floor van. They are very professional, kind and comforting. Thank you so much for your kind service. Sandy and Winnie!! Driver helped me today in a bind. Locked my keys in my car while it was running and he said he would be back in 20 minutes because he had to pick up another car and he was! Then he popped my door open within 5 minutes. Was extremely friendly and kind. Will recommend to friends and family. Thank you so much! Second time I've called them to help me out of a jam. Very friendly, reasonable and quick to get to your location. If I'm ever out that way again and in another bind; I've got their number saved. I just wanted to say that you guys have done the impossible, and did it with effortless ease. I contacted many different services, and no one would touch my job. Jk towing took the job even before knowing what it was that needed done. Jason was awesome and knew exactly what needed doing to get it done. And the price was very reasonable. Just wanna say thank you for everything, and I will be calling Jk towing before anyone else on any future problem I may run across. These guys are amazing, helped me find a transmission mechanic, I had no idea who to go too. And they were very professional and courteous, will certainly recommend them to family and friends!! Fantastic service & very nice people! Came from one hour away at 2 am to help us out. Highly recommend. Had an accident tonight, they were there extremely fast. They took great care in loading my car and unloading it. Very friendly and even went the extra mile to help me ensure my son stayed safe during the process of getting towed! Would highly recommend them to anyone needing assistance! They took a bad experience and made it so much easier to deal with! Had an amazing experience. Treated my brother in-law's race car Tremendously! The car is a 2011 fully redone Camaro. Amazing and will definitely use this service for myself and I recommend them to anyone! Thanks guys. Simply the best. I can't say enough about Jason and Mark. These guys were a class act from the moment they picked up my phone call to the moment my car was off their truck. They arrived unbelievably fast and actually cared about the treatment of my car and my rim. I was 6 hours from home and in a bind and these guys really came through at a reasonable cost. They even told me they wouldn't leave me until the shop knew they could fix the tire. Now THAT'S caring for your customer and taking pride in your work. They took credit card and even emailed me the receipt for my convenience. These guys are the real deal and I would recommend them to anybody. Thanks guys!